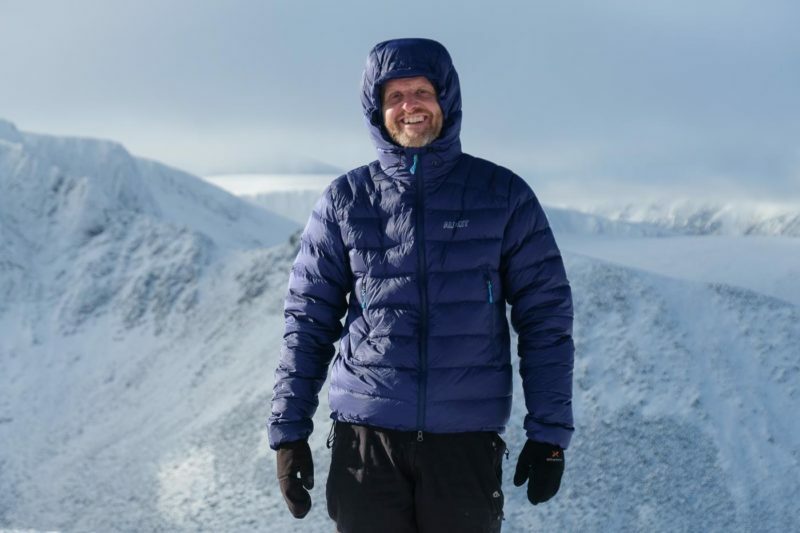 I’ve been testing the revamped 2019 version of Alpkit’s Phantac down jacket, which is designed to keep you really toasty whilst keeping weight low. To this end it uses higher quality 750 fill power goose down – the fill power is a measure of how much warmth the down provides per unit of weight – the men’s large as tested contains 225g of this down. The filling is also DownTek-treated which reduces the amount of water it absorbs and thus helps the jacket perform better in the sort of damp conditions we’re all too familiar with in Scotland. It’s also certified to the responsible down standard which forbids forced feeding and live plucking â€“ an ethical concern with some down garments. The outer fabric is a nylon ripstop, treated with a water repellent coating. This feels durable and I’ve had almost no down coming through, something I’ve had a problem with on some down jackets. The one downside of this is that the fabric has a rustle as you move – in my opinion a price worth paying for the extra durability. The hood is large enough to go over a helmet; the volume adjustable with a rear toggle, whilst the front can be adjusted through toggles inside the pockets so you can adjust it without getting your hands cold – a nice touch. The two external pockets are placed high to enable easy access when wearing a harness – or simply your rucksack hip belt. Inside are two larger mesh pockets, and a higher zipped pocket that can help keep your phone or GPS warm. The baffles are stitch-through, which helps keep the weight down compared to box-wall designs which are more consistently warm. I’ve previously had one of the original Alpkit Filo jackets, which was a real favourite in the coldest conditions. The Phantac is much less bulky than the Filo and contains less down, but with the higher fill power, I’ve found the Phantac to provide plenty of warmth. Whilst down jackets really come into their own at rest stops, when belaying or at winter camps, I’ve worn the Filo just over a baselayer when ascending on cold days without building up much sweat inside. It’s a really excellent and practical down jacket at a very reasonable price. Alpkit have a small number of stores but their kit is available direct from their website.